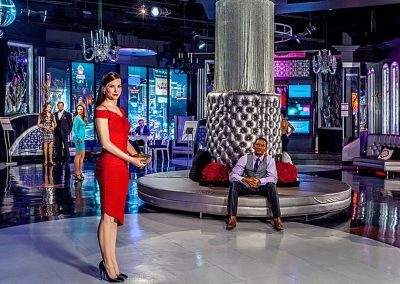 A Vegas branch of the famed wax museum. It’s pretty pricey so you have to really like wax. You can save yourself some dough if you buy online and are willing to go at off-peak hours. Better and better every time I visit. When I first visited Madame Tussaud’s at The Venetian, I must admit that I left feeling more creeped out than entertained. Sure, we can blame part of it on 1953’s “House of Wax” with Vincent Price, which will automatically make you view wax figures with suspicion and dread, but the bigger part of it was that there wasn’t much more to the attraction than a bunch of statues standing around. Over the last few years, the Vegas Tussaud’s has been, well, Vegas-a-fied adding more spectacle and show to proceedings that I think make it a much more enjoyable experience overall. 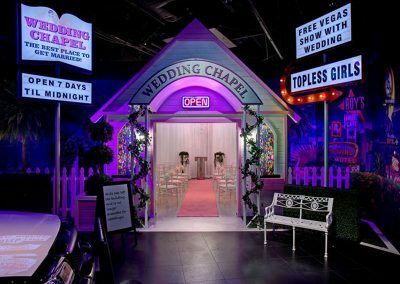 Overhauls, expansions, and new interactive exhibits have turned it into a fun, kitschy bit of Vegas entertainment. For the uninitiated, Madame Tussaud was a real person, having risen to fame for her lifelike wax figures during the French revolution. She was forced to prove her allegiance to France by creating death masks for executed French nobles. Charming and not at all creepy, right? 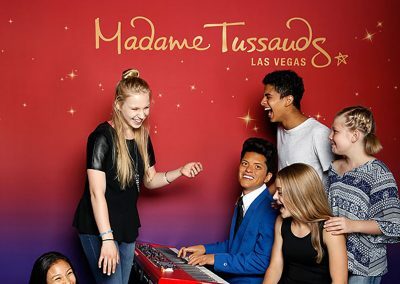 For the last 200 or so years, the wax figures have moved from royalty to celebrity, with museums in London, Amsterdam, New York, Hong Kong, and this one in Las Vegas. 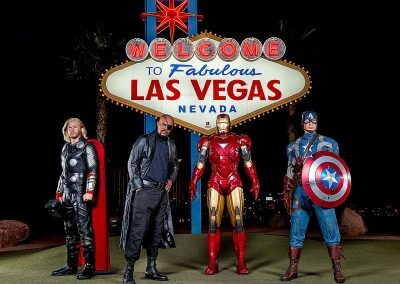 The 30,000 square-foot facility is divided up into several themed-rooms with celebrities from all walks of life featured throughout. Although the exact people immortalized rotate periodically, figure upon seeing celebrities from movies, television, music, sports, and even politics. Some of the figures are so good that you want to touch them – which you can. They encourage you to poke and prod and take pictures along the way. I admit to very hesitantly touching a few of the figures because I was sure they were going to leap up and strangle me and encase me in wax so I could be displayed… sorry… got carried away there. It’s the interactive exhibits that really make the cover charge more palatable. You can put yourself in the set of “The Hangover” with Bradley Cooper and Zack Galifinakas, complete with a trashed hotel room, a wedding chapel, and a surprise if you peek in the bathroom; cup J-Lo’s, umm, “assets” and get a blushing reaction from her; become a guest on “The Jerry Springer Show;” and even do the iconic “Smooth Criminal” “lean” with some help from a well-placed green-screen device. A full Vegas themed room has everyone from Siegfried & Roy to Better Midler to the Rat Pack and Elvis, of course. 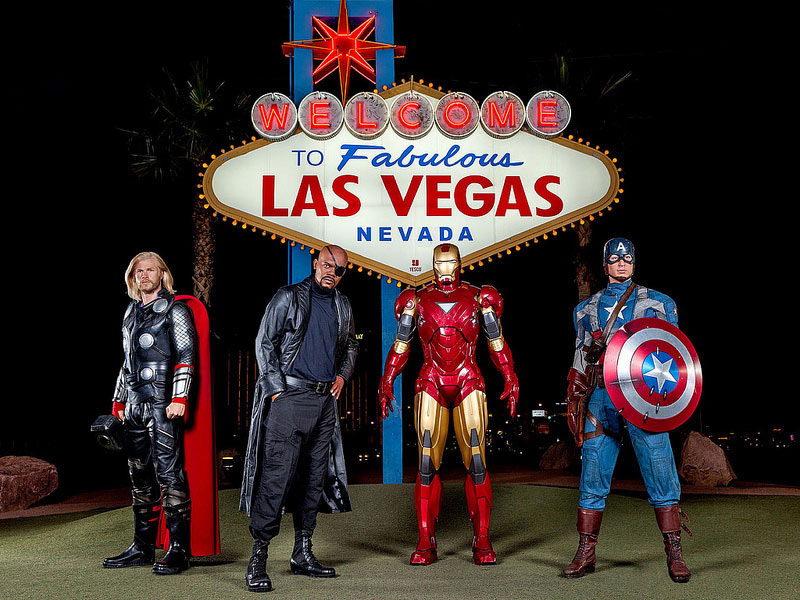 One of the most popular recent additions is dedicated to Marvel Super Heroes like The Avengers, complete with a giant Hulk smashing through a wall and a 4-D theater showing an animated movie that puts Spider-Man, The Hulk, Thor, and Iron Man in a battle to save earth once again. It includes water, wind, and shaking special effects to heighten the typical 3-D movie experience and while it may not break any new ground, it’s a fun distraction with a few surprises. These exhibits also change periodically but it gives you an idea of what you can expect. At more than $30 a pop, it’s a little pricey for wax, but it’s worth noting that you can get 20% off your ticket price if you buy online in advance. The website link is above. I personally miss the haunted house section they used to have but that’s just my personal taste and the newer attractions will more than make up for its absence for most visitors. So go, enjoy the silly fun, and don’t worry about what Professor Jarrod was doing in “House of Wax.” It’s just a movie… isn’t it?